For those who just need a little bit of storage space to keep some tools and gardening items safe, the Rowlinson 4 x 3 Oxford Pressure Treated Shiplap Wooden is perfect. It is being sold for a great price and it really does not take up much space in your garden either, which is ideal if your garden is not all that large. Despite the compact size, the door on the front of the shed is still a very good size, making getting things in and out hassle free. While the shed is under £200, they have still managed in some places to use some very high end materials. This is most notable with the cladding. 12 mm thick tongue and groove shiplap cladding which is pressure treated has been used. This cladding is very strong, looks fantastic and it is pretty much watertight. The roof and floor boarding they have used is strong enough and it also helps in keeping the overall cost of the shed down. 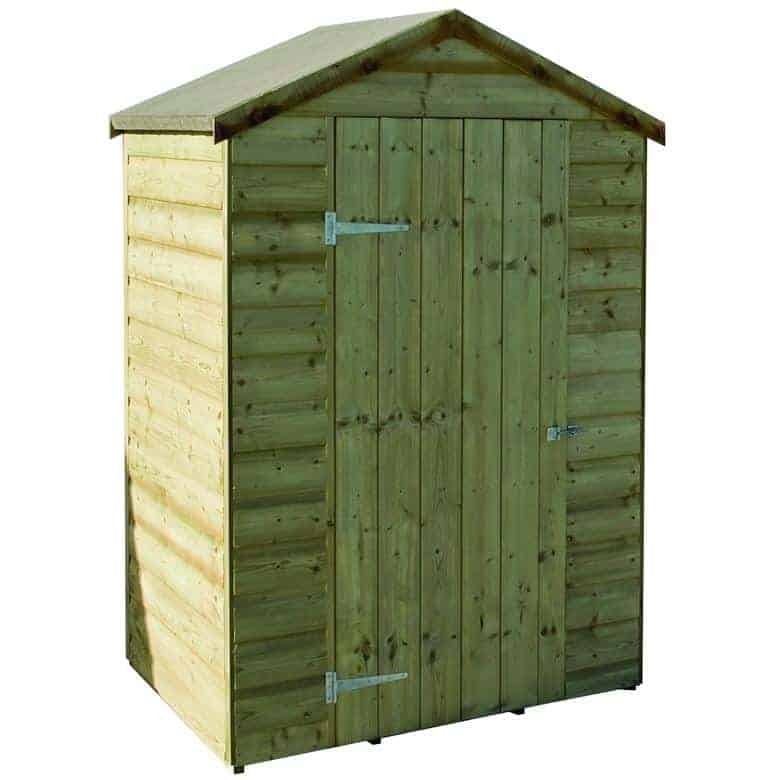 At under £200, the Rowlinson 4 x 3 Oxford Pressure Treated Shiplap Wooden Shed is the perfect solution for those who just need a little bit of storage space to keep a few tools, kids garden toys or your gardening equipment out of the rain and off the lawn. 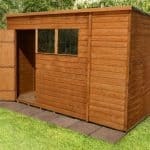 This is a smaller sized shed, so it will fit into any garden and it does not take up much space at all. The shed is 4 feet 2 inches wide and 3 feet deep. 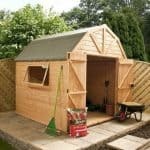 While this does sound a little snug, we feel that the storage space on offer here is ideal for those who just need a little bit of storage space and do not want a shed taking up a lot of real estate in the garden. Along the ridge of the shed the headroom is 6 feet 3 inches high, so there is a very nice amount of headroom inside here. They have gone for an apex roof and we think that was the right decision. The roof is made with solid sheet boarding and then covered with mineral felt. At this price range this is the exact kind of roof we would expect. It may not be the fanciest roof, but it will certainly get the job done. This is a budget priced shed and you can clearly tell that most of the budget for the design went to the cladding. The Rowlinson 4 x 3 Oxford Pressure Treated Shiplap Wooden Shed is made with some very smooth looking tongue and groove shiplap cladding. It is 12 mm thick so it is also very strong and offers the rain no little cracks or areas to get inside. For the price, we are really impressed with the cladding they have used here. You have a strong frame inside the shed that along with the cladding makes this a far more robust shed than the price tag suggests. 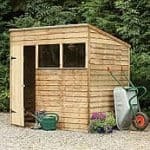 They have not exactly disclosed the side of the frame, but given the price of this shed, you will be looking at a minimum of 28 mm x 28 mm, which is the standard sized frame for a shed of this size and budget. To help keep the cost down, Rowlinson have used the same kind of boarding for the floor that they have for the roof. Solid sheet boarding is ideal for sheds where you literally just want a space to store a few items and you do not care so much what the shed looks like. While this is a somewhat cheaper flooring option, it is still strong enough to handle a fair amount of weight from things like gardening equipment and tools. As the Rowlinson 4 x 3 Oxford Pressure Treated Shiplap Wooden Shed is pressure treated there is no treatment required. We are not just talking about once you have installed it, but also five or ten years down the line. The pressure treatment process that the wood has gone through makes this shed very low maintenance. 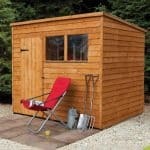 We really wish we could tell you exactly what the warranty for this shed is, but they have not actually disclosed this. This is very frustrating and odd as it means you will have to inquire before you order. But here at WhatShed, we have seen many sheds like this and most sheds that are pressure treated tend to come with at least a ten year anti rot guarantee. Front and centre is a single door. This is actually a pretty decent size for a single door, you can see that it takes up most of the front of the shed. It is kept in place with two long and solid hinges so the door will feel pretty solid. We also really like the way the vertical cladding on the door goes with the cladding on the rest of the shed. The Rowlinson 4 x 3 Oxford Pressure Treated Shiplap Wooden Shed is fully boarded so there are no windows at all. To be honest we have no problems with this. As the kind of person this shed is made for is one who opens the door, grabs something like a rake, uses it and just tosses it back in, there is no need for a window on a shed like this. If you take a close look at the door you will see that there is a rather basic hasp and staple on there. This will keep the door closed, but if you want to make sure your items are kept safely away you will want to add a padlock. As the shed is fully boarded, you do not have any issues with privacy. Well unless one of the kids leaves the door wide open of course. There are not any customisation options offered with the Rowlinson 4 x 3 Oxford Pressure Treated Shiplap Wooden Shed. This is not something we have an issue with, as this is meant for people who just want a shed that they do not have to worry about a load of different options when they purchase it. There are just a couple of extras on offer here. The first one is actually pretty practical. It is a security hasp and padlock set which is high quality, secure and only costs £4.99. The other extra is really weird as it is a Suncast Golf Storage Organiser which costs £107.99. Which is great if you are into golf we guess, but it is still a very unusual extra to offer. This is a budget priced shed and clearly most of the attention went into the cladding, but we feel for the asking price the quality is fine. That pressure treated tongue and groove cladding is going to last for many, many years. Best of all, you do not have to worry about treating the shed in order for it to last a long time. While this is a rather small shed, we feel its size may actually be a huge selling point to some people. It means it will fit inside any size of garden. Plus as it is rather high, you can store items by stacking them quite highly. With the help of a friend, you will have this installed in 4-6 hours at the very most. It is fully boarded, the door is hassle free and the roof is not that large. So in all honesty we do not see anything that is going to give you too many headaches when it comes to installation. 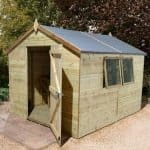 At under £200 and with the wood being pressure treated, we really do feel that this is a shed which is excellent value for money. If you do not want to spend a fortune or if you do not have a large garden, we feel that the Rowlinson 4 x 3 Oxford Pressure Treated Shiplap Wooden Shed is something you have to consider. It may have a basic roof and flooring, but the very impressive pressure treated cladding makes up for that. Actually, considering the price, it is quite surprising that this shed has as high quality cladding as it does. 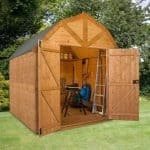 We know it may not be the fanciest shed in the world, but for those who just want something basic and affordable, we really do think that this shed is well worth putting on your maybe list.